Have you ever written a proof argument for your genealogical research? I know the Genealogical Proof Standard incorporates writing a proof argument - a soundly based conclusion that others can follow. I try to do exhaustive research, citing the sources behind the facts attached to individuals in my tree. However, I've never written a detailed proof argument. I'm in the middle of a lot of 'same name' research in Kentucky around 1800. To help me think through the evaluation of the records, I've been writing blog posts about this research. 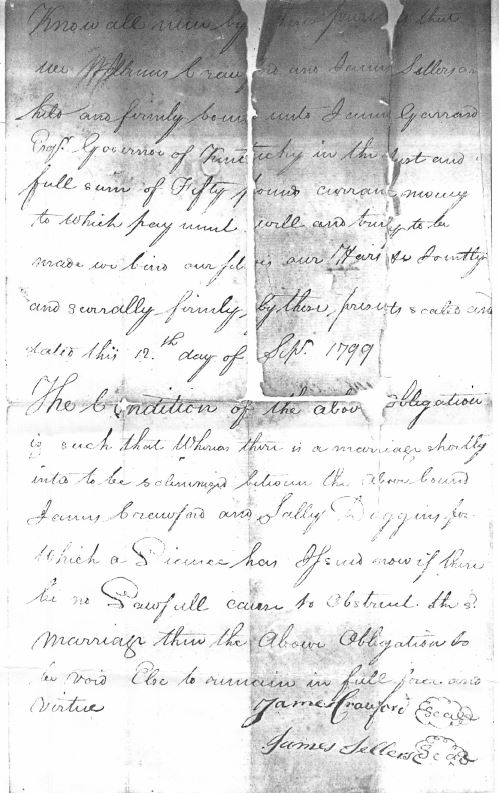 One of the goals of this research is to identify parents or siblings of my ancestor, James Crawford (1772-1854) who married Sally Duggins in Garrard County, Kentucky in 1799. Unfortunately, there is another James Crawford (1770-1833) who lived next to my ancestor in Preble County, Ohio. This James Crawford married Martha Knight in Lincoln County, Kentucky in 1793. Living in the area at the time were several candidates for the parents of these two men. James Crawford (1758-1836) and his wife Rebecca Anderson lived in Garrard County, KY along the Paint Lick Creek before moving to Indiana. William Crawford (1748-1809) also lived along Paint Lick Creek before moving to Ste. Genevieve, Louisiana Territory. Mary Crawford (abt 1755 - ?) was listed as a widow on the Madison County, Kentucky tax list in 1792. She married Alexander Moore in 1793. Rebekah Crawford (1750- ?) was listed as a widow on the Lincoln County, Kentucky tax list in 1787. John Crawford (?-?) was listed in Lincoln County on the 1787 tax list for Lincoln County, Kentucky. Other researchers have identified the children of James and William. Both families include a son named James. Both of these James Crawfords were too young to be either of the James Crawfords of Preble County. None of the records for these sons place them in the area of Preble County, Ohio. Thus, I have eliminated James and William as potential fathers. When I started tracing records for John Crawford, I thought he might be a potential parent. However, I've uncovered several power of attorney deeds that suggest that John Crawford's land passed to heirs other than children. I need to do more research on these other families, but I don't believe John Crawford is a father to either of the James Crawfords of Preble County. Assuming a parent was in the Lincoln, Garrard, Madison counties area at the time of their marriage, that leaves Rebekah and Mary Crawford as potential mothers. For some time, the theory has been that Rebekah is the mother of the James Crawford who married Martha Knight. The evidence to support this theory revolves around marriage bonds. After reviewing some land records for Rebekah Crawford, I believe she sold her land to James Aldridge. Also listed on the deed as a grantor was James Crawford. I believe this deed supports the theory that Rebekah Crawford is the mother of a James Crawford. This deed indicates that Rebecca Crawford and James Crawford are of Barren County, Kentucky. In 1821, James and Martha Crawford of Preble County, Ohio sold land lying in Barren County, Kentucky. Thus, I believe the James Crawford who married Martha Knight is the son of the widow Rebecca Crawford. I will continue looking for records to support OR disprove this theory.